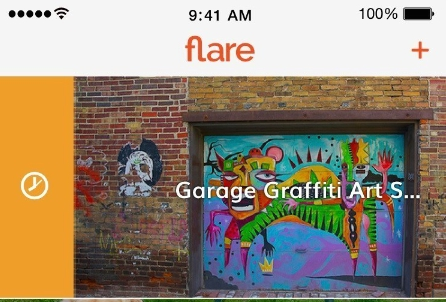 GoDaddy launched a cool app today called Flare, so that entrepreneurs can gain needed feedback on new business ideas from their friends, experts and other small business owners. Flare is available immediately in the Apple App Store. It will launch in June on Google Play for Android devices. GoDaddy says that Flare empowers people to share ideas and get guidance from friends, fellow entrepreneurs, and experts in a fun and collaborative way, providing an immediate resource to receive feedback and drive new concepts or ideas forward. Recently, GoDaddy conducted a study where 67% of their business oriented user base has come up with a concept for a business, product or service, but just 15% actually went passed the idea stage and tried to create a business. – Flare represents the latest example of GoDaddy’s ongoing commitment to develop innovative technologies and products designed to empower entrepreneurs – whether they’re looking to simply get started with a new idea, get online, or grow a business. Flare is a social network that connects entrepreneurs to fellow entrepreneurs, potential consumers, investors and experts and creates community around new ideas. Study: Nobody Cares About Facebook "Reactions"